Since moving to Queensland in 2003, I’ve kept a checklist of animals that visit or have moved into my evolving organic garden. This new wasp is the 28th species I’ve observed here, and is the 379th recorded species in my 800 square metre suburban garden. In terms of global biodiversity, Australia has a big slice of different kinds. Some are predatory, others parasitic. Many are tiny. Few are willing to sting, remaining polite even when they’re disturbed having dinner. I have a small, recently arrived wasp species. And according to Graham, a consultant insect taxonomist for the NT Museum, it’s endemic and unusual. Adults drink nectar from my golden rod plants (Solidago sp. ), but their larvae are carnivorous. The gold-tipped leafcutter bee, Megachile chrysopyga, is one of their host species. It’s currently common in my garden where it is pollinating the basil that borders my lawn. Perhaps they have drawn this little studied wasp species here. “The wasp is a species of the genus Leucospis, in the family Leucospidae. There are 11 Australian species of Leucospis. They are ectoparasitic on other aculeate wasps as well as megachilid bees. They are not common, and I’ve only seen 2 or 3 in my travels. They may have a preference for parasitising wasps in mud nests (most of which parasitise either wasps or spiders). Any observations of the Leucospis behaviour could be interesting”. With such fabulous beasts around, I’ll keep my camera handy. Species 379 recorded at Bellis: Leucospis sp. Gold-tipped leafcutter bee, Megachile chrysopyga, one of the hosts for Leucospis spp. Curiously powerful backlegs. Usually grasshoppers etc have these kinds of legs for jumping. Wonder why the wasp needs them. The legs help define the genus (apparently), but they’re so poorly studied this amateur has been asked to help make observations! I looked at the link your friend gave (google pics) – perhaps the legs are designed to help the wasp raise itself into position with it’s ovipositor for egglaying? Have fun with your observations 🙂 I get a real kick out of trying to identify the insects (and birds) that come to my garden. Have to take issue with your ‘nice wasps’ statement, Gerry. One of the paper wasps up here has a very painful sting – intense pain which thankfully only lasts for a minute or so. I first found this out when a piece of peeling gum bark with nest attached happened to fall right near me where I was working in the garden. They blamed me for their predicament and I set off across the paddock swatting at these nasty little creatures stinging my neck, face and arms. I envisaged having to jump into the pool to get rid of them but thankfully they gave up fairly quickly – hubby had a good laugh as I apparently looked like a cartoon character being chased by a swarm of bees – great! So not all wasps are nice!!!! 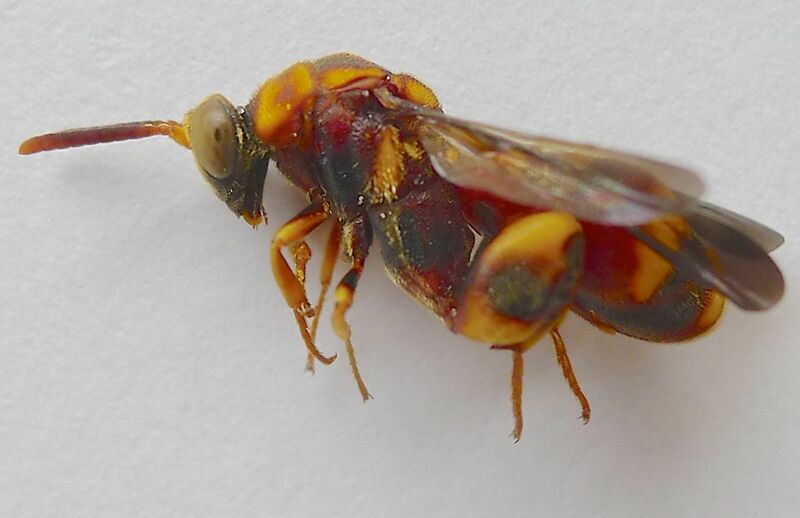 Wasps are essential biodiversity – unless you’ve lived with and stung by European wasps, Im sorry but there’s nothing in Australian wasps that approaches them, nothing at all. I’m jealous of your biodiversity. My veggie garden seems entirely pollinated by a single blue banded bee. I’m thinking of naming my garden ‘Lonely Bee Gardens’. Blue banded bees are a very good start. My place was just grass 9 years ago, just be patient, avoid chemicals, grow diverse plants. That’s being kind, Jeff. Stings by European wasps often result in humans developing allergies later in life. Unlike australian wasp stings, which mostly cause minor discomfort, European wasp stings on the tongue can be fatal. Once you’ve met a mother whose baby was stung to death by European wasps you tend to take them seriously. In Australia these pests are more dangerous than funnel web spiders! My mum said to run in and rub onion on it and it soothed it straight away!!! Native wasps do not bite. If you got stung twice, that means you got stung by two separate females. Your baby was completely safe – you were the target – not your baby. You damaged their nursery, by gardening there you threatened their babies. They sting to protect them from harm.